When it comes to finding an online discount brokerage, there is no shortage of options available out there. When choosing a brokerage that will work for you it's important to weigh all the factors that matter to you, and figure out which one will be the most affordable and useful for your situation. If trades are too expensive, it will take a bite out of your returns. OptionsHouse, one of the first discount brokers that I've looked at has extremely low $3.95 trades, which is definitely one of the lowest in terms of cost when it comes to the discount brokerages. Add to that the fact that they consistently get good reviews, and have a good slate of tools to use, and they're a good option to consider. OptionsHouse is an online investing company founded in 2005 with operations in Chicago, Illinois. Investors on OptionsHouse.com have access to the company's online brokerage,where they can trade stocks, options, mutual funds and bonds. OptionsHouse, L.L.C. was founded by PEAK6 Investments, L.P., an options-trading firm, and also one of the largest in terms of volume. OptionsHouse is member of SIPC, which means your investments are protected by SIPC insurance up to $500,000 and $100,000 of it can be in cash. This means that you are protected against the company going into insolvency. You are not protected against market losses. Barron’s also rated OptionsHouse #1 in Trade Experience in their 2009 Online Broker Survey. Probably one of the most important things to consider when opening an online brokerage account is to consider what fees, commissions and minimums you'll see when using an account. When it comes to trading stocks, OptionsHouse has one of the lowest rates in the industry with $3.95 stock trades. That rate is regardless of how many shares are purchased or if it is a broker assisted trade. Compare that to it's next lowest competitor, TradeKing at $4.95 a trade, and you're getting a pretty decent deal. Check the graphic below to compare rates with other discount brokerages. 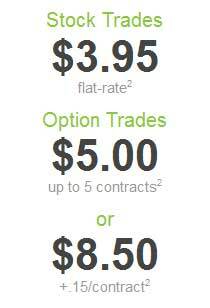 OptionsHouse two pricing structures when it comes to options trades. Option 1 works best for customers who trade less than 10 options contracts per leg. It's called the “5 for $5” plan. Single leg trades under this plan are $5 for up to 5 contracts, and $1 for each additional contract over 5. Option 2 works better for customers who typically trade more than 10 contracts per leg. Under this plan single leg trades are $8.50 plus .15 cents for each additional contract. There are no charges for broker assisted trades. OptionsHouse doesn't have account maintenance fees, monthly minimums, inactivity fees or additional charges for broker assisted trades. All prices are charged on a flat rate, and what you see is what you pay. There is a minimum account funding level of $1,000 to open a cash account and $2,000 to open a margin account. OptionsHouse trading tools include streaming charts and news, volatility charts, a probability calculator, risk viewer, stock screener, an options hotlist and more. Many of these tools were created by the options trading pros at PEAK6, who continue to use the prototypes to generate and test option trading ideas. If you're still not sure if OptionsHouse is the one for you, they have a cool option where you can take the site for a test drive with their Virtual Trading platform. You sign up and get $5000 of virtual money that you can use to trade stocks, options and more. You can then watch the performance of your virtual money, check out all of their great tools, and essentially use their platform with no risk. When considering an online discount brokerage OptionsHouse is definitely one of the best options out there. They've got low fees, reasonable commissions and their slate of tools to help you make the right decisions are second to none. They've also been awarded by Barron's for their usability, and as the best choice for options traders. When you consider all of these things together they are definitely at the top of my list. Have you used OptionsHouse? What has your experience been like? Are you happy with them? Tell us your thoughts in the comments. To Open An Account With OptionsHouse Click Here. Previous Post: When Is The IRA Contribution And Recharacterization Deadline?